Stratolaunch Systems completed the inaugural flight of a 500K-pound, all-composite aircraft on Saturday over the Mojave Desert in California. The Stratolaunch plane, which took off from the Mojave Air and Space Port, reached a maximum speed of up to 189 miles per hour and an altitude of up to 17K feet during its maiden voyage that lasted for 2.5 hours, the company said Saturday. Northrop Grumman's Scaled Composites subsidiary helped build the vehicle. Jean Floyd, CEO of Stratolaunch, said the initial flight demonstrates "our mission to provide a flexible alternative to ground launched systems." 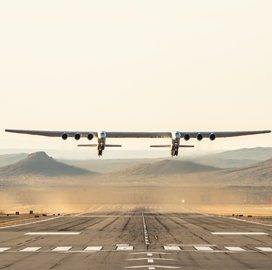 The company noted its platform has a wingspan that is bigger than the average length of a football field in the U.S. and is built to accommodate multiple launch vehicles. The aircraft performed flight control maneuvers, such as roll doublets and steady-heading sideslips, and a simulated landing approach during standard tests that took place as part of the maiden flight.